Personal Reflections by the Director of Communications of the Dalai Lama Centre for Compassion. The energy and commitment that the Dalai Lama has – at the age of 80 – for inspiring compassionate action is quite simply astounding. On Tuesday, we had the pleasure of spending over four hours in the company of Tenzin Gyatso, the 14th Dalai Lama. His Holiness was here in Oxford to officially open the Dalai Lama Centre for Compassion, as well as to talk to invited guests, the press, various scholars, and a group of local school children. The day began with an unusually long press conference at which the assembled journalists were noticeably humbled and slightly overawed. In what turned out to be a shrewd move by the Dalai Lama, he spent 45 minutes outlining his ideas on friendship and community, inter-religious dialogue, and the importance of compassion for wellbeing. This left only 15 minutes for the predictable questions about Chinese politics and the like. His Holiness pointed out that he had not been to Tibet for decades, so thought the press should decide for themselves the impact of Chinese development on Tibet and its inhabitants. It is His Holiness’ greatest wish that the world understand the vital importance of compassionate action, which has the power to build happy and healthy societies. He called both upon the great and the good of Oxford University and upon the schoolchildren – the leaders of tomorrow – to nurture ‘inner values’, propagate well-being, and reject anger and fear. In his conversations with the Oxford dons, he was gracious and humble. In contrast to the sometimes confrontational nature of academic philosophy, he responded to questions from the Fellows and Trustees with a fair-handed, broad-brush approach. He engaged in a lively discussion with Sir Richard Sorabji about Gandhi, and whether it is right that we sometimes need negative emotions, such as anger, in order to affect change. His Holiness distinguished ‘destructive’ and ‘constructive’ versions of the emotion. Philosophically, the Dalai Lama, questioned the materialistic view of the mind that has been dominant in recent years, arguing that despite the enormous potential of contemporary neuroscience, the mental remains very difficult to understand in wholly physical terms. His Holiness also outlined the relationship between concepts used in quantum mechanics and those of ancient Indian philosophers. Paul Lodge’s emphasis on the subjectivity of consciousness, his suggestion that moral values are essentially inner values, and Father Timothy Radcliffe’s idea of a contemplative life, all met with a positive reaction from His Holiness. Stephen Priest asked whether a life wholly devoid of suffering would lack meaning. 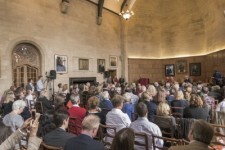 In the afternoon session, chaired by the Director of the Centre, Alexander Norman, the Dalai Lama addressed a large group of invited guests who had bought tickets to the event. This talk was full of laughter and a fair few surprises – not least when the Dalai Lama pulled the nose of the Director! In the interesting dialogue with Alex Norman, he reflected carefully on his own life and upbringing, often mentioning the people (and animals) around him from whom he had learned so much. The Dalai Lama has a great affection for animals and told several anecdotes involving dogs, cats, parrots and fish. He explained that if you observe animals, you can see that they give affection and act compassionately instinctively. It is only when they are mistreated that they become aggressive. One of the biggest surprises of the day was when the Dalai Lama spoke at length about his relationship with Chairman Mao. He told us how, in the early days before the Cultural Revolution, Mao and he were on very good terms. Mao would use his chopsticks to move food from his own plate to the Lama’s: an important sign of respect. The Dalai Lama even said that he is himself a Marxist, in the sense that he affirms the equality of persons. I have often heard it said that the Dalai Lama thinks that the symbol of mother and child is a good emblem for compassion, but was never quite sure exactly what this meant. This was explained in greater detail by His Holiness, who pointed out that every single person on this earth comes from a mother’s womb. This means we all share the same start in life: a common humanity. The newborn baby is completely dependent of the kindness of others, and this compassion comes from the mother in most societies. On a personal note, this really struck a chord with me. I, like the Dalai Lama (and perhaps like most people) had an extremely kind and compassionate mother, and believe that I can draw on the memories of her kindness in order to channel those qualities into my own actions. At 4pm, His Holiness departed for Cambridge, the next stage in the gruelling schedule of his UK tour which is to take in London and the O2 later in the week. Octogenarian stamina. After the talk, a selection of business people, academics of different disciplines, charity organisers and practitioners in the NHS and schools met and exchanged ideas, inspired by having heard the Dalai Lama only moments ago. I have no doubt that a fair few of them will have been moved by the words of His Holiness and realise that we, in Oxford, might be catalysts for change.